The interesting thing about this book, for one, is it tells the history of the Prayer Shawl and how it originated, and more. This has caught on at many churches and other kinds of groups all over the country. There is a lot of valuable information included in this book to read about. The point of the Prayer Shawl is to make and give the shawls to people who are going through different times of their lives. For example, for a mother whose son or daughter has just graduated, to a person who is going through a life struggle, to a person who has lost a loved one, or even to make one of these for a family member. It has many more examples to give these as well. In my own search for patterns or pattern books for shawls, I have found it is very difficult to find them, much less find such gorgeous and detailed patterns. This book has an absolute abundance of shawl patterns to crochet. I believe this book has to have the largest selection of shawls to crochet included in it that I have ever seen. This book is wonderful. The shawls are photographed so you can see the full shawl in a variety of views, and you can even see the details of the stitches. I cannot get over how absolutely beautiful this variety of shawls is. The patterns/directions are all included for every single shawl in this book, so you are able to make all of them, and, in my opinion, the directions are not difficult. I think anyone can pick up any one of these patterns and crochet them, even for beginners. I have a relative who is involved in a Prayer Shawl group, and they only have ‘one’ pattern for a ‘crocheted’ shawl that all of the members make. This would help groups expand the types of shawls they can crochet from one, to many. Your own church you attend may have something like this, as I have seen these groups advertised at many churches and at other groups. I have also heard of people who don’t belong to churches or groups that make these. They make the shawls at home and donate them to the Prayer Shawl groups. Because I know about Prayer Shawl groups, this is why this book piqued my interest in wanting to read and write a review of the book. 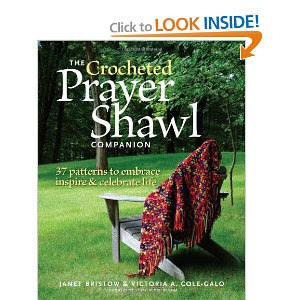 This is the perfect book for your church or other group, or for whoever makes Prayer Shawls or wants to crochet shawls! I received this book “free” and was not provided with any monies to read and write a review about this book. I received this book from The Taunton Press through NetGalley.com through the book reviewers program. I was not required to write a positive review. The opinions expressed are my own. I am disclosing this in accordance with the Federal Trade Commission’s 16 CFR, Part 255, http://www.access.gpo.gov/nara/cfr/waisidx_03/16cfr255_o3.html Guides Concerning the Use of Endorsements and Testimonials in Advertising.